Help me find an award! 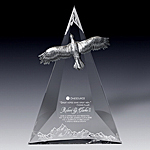 We offer a varied and extensive selection of crystal awards, trophies and gifts. Our current on-line catalog has over 300 different award and trophy styles. 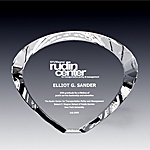 We constantly add new designs to our crystal award collections. To help you navigate through our web catalog, you can use quick links below. If you do not find what you are looking for, please give us a call and we will help you locate an award, gift or a trophy. 1. Rush Inventory - 2-3 business day turn around. These awards are prefabricated and are ready to be engraved and shipped within 2-3 business days while supply lasts. Because these awards are already fabricated, we will wave a rush order fee. Rush inventory status changes dynamically. Please keep in mind that we can also fabricate and engrave any other award within 1-3 business days, however rush order fees will apply. Prior to ordering please contact us first at 1-800-506-7966 to ensure availability. 2. Very Tall Awards and Trophies. 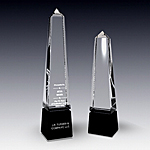 Typically awards in our obelisk category are taller than other awards. 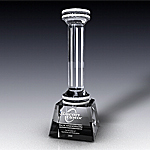 If you are presenting an award or a trophy that has to be visible from far or simply very impressive looking, consider trophies that are over 12" tall. 3. Large Etch Space Awards and Trophies. 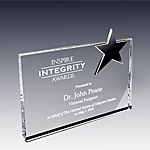 To fit extensive personalization text and or multiple logos consider our awards that offer larger etch spaces. Traditionally, the plaque category represents awards that are wider. 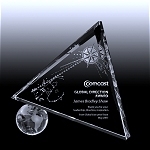 If you have more than 24 words of personalization you will need an award with large etch space. 4. Big Awards and Trophies. If you wish to impress and surprise the recipient with the size of the award, consider the following big award and trophies and cups. 5. Industry or Occupation Specific Awards and Trophies. If you do not find what you are looking for, feel free to email us with your special request inquiry. 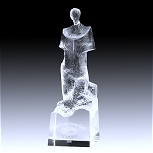 Keep in mind that many awards can be personalized further by engraving industry specific images. 6. Event or Occasion Specific Awards, Trophies and Gifts. 7. Gender Specific Awards - Ladies or Gents. goddess of star goddess of universe pillars of the universe inspiration vases and bowls.